Stone crabs are one of the most sought out delicacies in Miami. The crabs have small bodies and are rarely eaten, but the claws are large and contain delicate crab meat that is so delicious, you'd want to eat 10 of them in one go. They take a bit of time to mature, but once the crabs are at the right size, the claws are detached and the bodies are thrown back in the water where they can regenerate! So enough about this bio stuff, lets get talking about this place and the food! Joe's Stone Crab is an iconic eatery in Miami. They have another location in Las Vegas, but I think it's always a good idea to eat at the O.G. place. The restaurant itself is massive with a huge bar where you can grab a drink while passing time for your 1-2 hour wait. Yes, the wait usually is always that length of time since they don't take reservations! It's casual-ish with waiters dressed up in tuxedos like the olden days. They're very proper and lack a bit of the complete service I was hoping for, but I guess if you want to focus on the food, it's pretty darn good. MAINE LOBSTER TAILS (STEAMED OR BROILED-MARKET PRICE). This was just ok for me. The lobster cost around $50-$60, which I think it s a bit overpriced. The tails themselves were rubbery and a bit overcooked in my opinion. The sauce helped a bit but once lobster is overcooked, the dish couldn't be saved. GRILLED ASPARAGUS ($9.95). The asparagus was good but nothing special. I probably wouldn't order this again but if I need vegetables, sure, why not? KEY LIME PIE ($8.95). This was almost my favorite dish of the night. It came as a very close second and probably the best key lime It was luscious and not overly sweet and the pie crust was amazing. I seriously loved this pie! MY FAVORITE DISH. JOE'S STONE CRAB (LARGE-MARKET PRICE). The crab was absolutely amazing. They come broken up for you so all you have to do is peel off the shell and eat the luscious piece of crab. We got the large, which ran about $60 ish. The crab meat was cold and sweet and came with an amazing sauce. It's worth ordering one just for yourself. 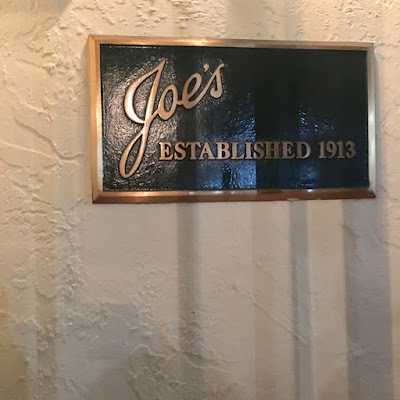 Overall, Joe's Stone Crab was pretty good, but the service could use a bit of improvement. If I came here again, I would just stick with the stone crab and the key lime pie. We had ordered a glass of wine, which they brought out but the wrong one where we then sent it back. The waiter gave us a hard time about it. In addition, we were overcharged another $60 for another set of stone crabs that we didn't order. The waiter also gave us a look as though we were wrong. Other than that, the place was good.